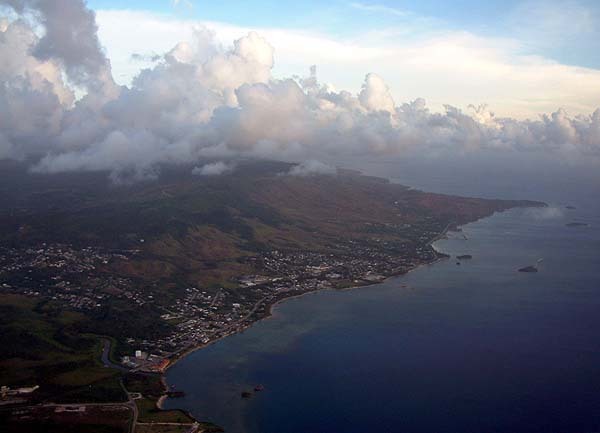 Flying in over Guam's central Western Coast. 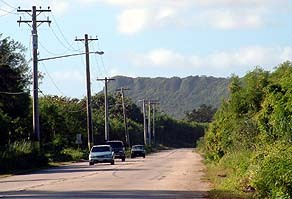 "Departing from Tumon, you will go through several landmarks on your way to Inarajan. You will go through the capital of Guam, Hagatña." 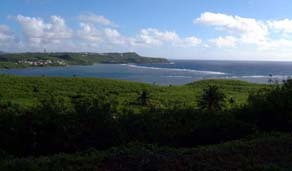 This village was not originally any more important than any other place on Guam, but became the focus of Spanish activity when Father San Vitores arrived in 1668. 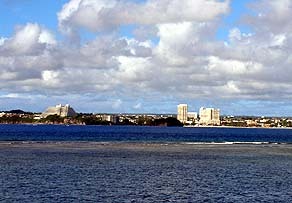 The areas of Tumon and Tamuning, just North of Hagåtña, are now the focus of tourism development. "After Hagåtña," Joe continues, "you will go through Chalan Pågo, across the middle of the island. Pago Bay, looking North back up the road. You arrive on the Eastern side of the Island at Pago Bay. This is the first of several bays you will pass as you travel down the coast to Inarajan. Not all of them can be seen from the road, but in several cases, the road winds down, around, and up past them. You will pass through the village of Yona. As you continue to drive down the Eastern coast, you will see the distinct edge or escarpment that delineates the island's elevated core.The road continues through Talofofo, and down into Inarajan. 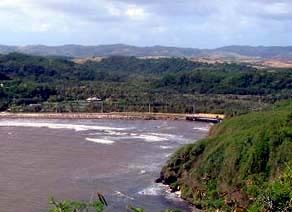 The bridge at Talofofo Bay marks the boundary of Inarajan. "If you look at the Southern villages," Joe says, "you can tell if youre entering a village by two things. One, theres a sign that will let you know that youre entering that village. And the other is that normally that sign will be either next to or close by a river. A lot of the old folks would say, even if the division is not on a river today, traditionally the division of two principalities has always been on a river." "So you know youre entering Inarajan when you cross the bridge at Talofofo. Talofofo Bay is not necessarily historically important, but it is well visited by not only locals, but by visitors, because its the only bay that has waves breaking that local people can go in and go surfing. Right at the mouth of Talofofo is a sunken ship." "You know when youre in Inarajan"--the village proper--"when you start to feel a little bit of the Spanish barrio streets: the situation of the homes, the architecture of the homes, and the large church structure." "As you leave Inarajan, you can see how the boundaries occur here, the boundaries between villages. Not only your modern boundary, which is a sign telling you that you are leaving that village, and that you are welcome to the other village, but also, again, theres always a river that would delineate the municipality between the two villages." 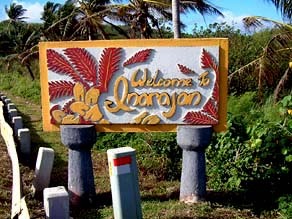 Welcome sign at the Talofofo Bridge entrance to Inarajan. Now you are ready to arrive in Inarajan.